Every year, thousands of deaths take place due to slips and falls. According to the National Safety Council, 32,000 people died in 2014 as a result of slip and fall accidents. Furthermore, $70 billion per year is claimed by the workers who slip and fall in the workplace. This results in higher premiums due to these huge amounts of worker compensation claims. Because of this, we highly advise you to take the necessary safety measures to prevent workplace slips and falls. The slip and fall attorneys at the PM Law Firm have put together some low-cost precautions that employers can take to prevent slips and falls in the workplace. 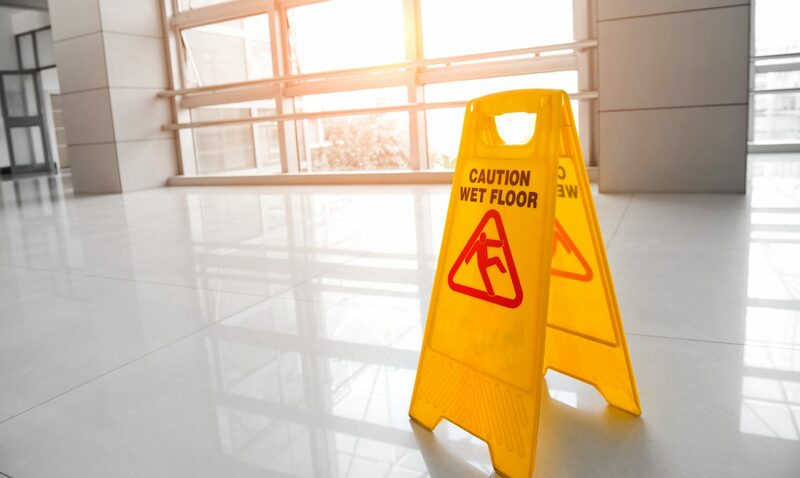 Wet floor signs must always be used when the floors are cleaned, washed, or mopped. These signs are easily available in the marketplace. Employers should provide proper training to their workers to prevent misuse of the premises. Keep the sidewalks and parking lots in neat and clean condition. Do remove the ice and snow from the outside surfaces. Use proper mats or rugs for the food preparation area. Open files, drawers, and loose cords in the lobby are all trip hazards. These cords should be inserted firmly into the wall and they must be tucked or taped down properly. In this way, cords will not snag on the feet of employees. Cluttered files, trash, or boxes in the walkways or halls can also cause slips and falls. Employers should adopt some effective policies to provide clear hallways and walkways to their personnel. Make sure to keep the files and boxes in a separate room to eliminate these hazards. Hurdles, materials, equipment and clutter in walkways, aisles, stairwells, corridors and entranceways also result in trips. Appropriate housekeeping in work areas is one of the best control measures to avoid proliferation of these hazards. Having proper procedures or policies in the workplace can help in avoiding trips as well. Keep all passageways, service areas, work areas and storerooms orderly and clean. Prevent stinging cords, air hoses, or cables in the designated aisle. Avoid leaving files, briefcases, or boxes in the corridors. Conduct inspections on regular basis in order to prevent slip and trip. Employees aren’t the only ones that might slip and fall on stairs. If your business hosts a public set of stairs, it’s important to keep them well maintained. Therefore, stairs should be inspected for loose debris or spills that may cause foot slips. Do take safety measures if there are slippery stairs in the workplace. Sufficient lighting should also be installed around the stairs. Grip strips for these types of stairs can be purchased from any local hardware store for overcoming slip and fall risks. ← What Should I Do If I Slip and Fall at Work?